Diving the Gulf is heating up! Summer fishing is here in Naples, a great time for some drag screaming action! This is one of our customers favorite times of the year and the time is now. From huge Barracuda, Cobia, Tarpon, Snook, and all types of reef fish, this is a great time to hook into a monster. 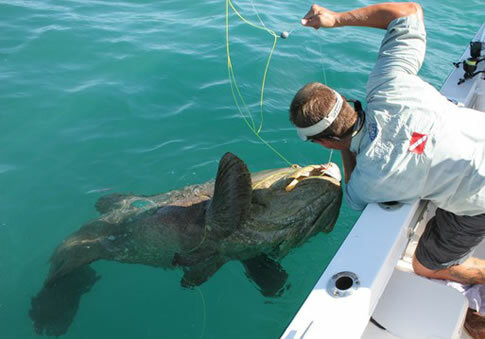 If you want a chance at a 500lb behemoth grouper or a silver king sky rocketing in air there is no doubt you will have a battle of a lifetime. There is always plenty of other action on the reefs to keep any fishing, party bending rods for hours and at the end of the trip most can take home a delicious fresh catch. Don’t second guess , come fish with the best! We don’t only have the most experience fishing these waters but have the day to day knowledge of what changes are going on under water by running our dive operation. You can say we have an unfair advantage over everyone else. So call 239-592-1200 today and book your fishing experience.